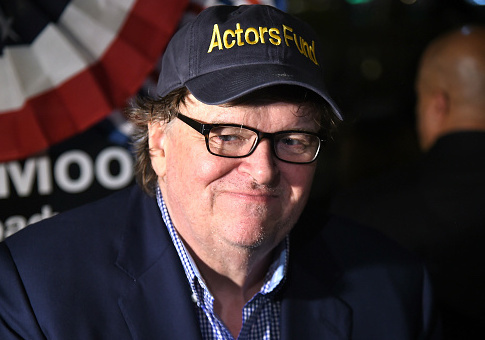 Documentary filmmaker and noted Hollywood liberal Michael Moore took part in an anti-Trump rally that prosecutors allege was organized by a number of Russian nationals suspected of meddling in the 2016 presidential election. Fox News reported that Moore attended what is now alleged to have been a Russian organized anti-Trump rally in front of Trump Tower in New York. The Nov. 12, 2016 event took place only days after President Donald Trump won an upset victory over former Secretary of State Hillary Clinton. Daily Caller contributor Derek Hunter first reported the news. "At today's Trump Tower protest. He wouldn't come down," Moore tweeted along with a link to FacebookLive coverage of him marching with protesters who are seen holding "not my president" and "stop Trump" placards. According to a grand jury indictment, which was signed by Special Counsel Robert Muller and released last Friday, the Nov. 12, "Trump is NOT my president" rally was organized by 13 Russian nationals who were charged with meddling in the 2016 presidential campaign. The 13 accused are alleged to have run a subversive campaign with the "strategic goal" to "sow discord in the U.S. political system," during and after the 2016 election. UPDATE: 8:13 P.M.: This article was updated to show the Daily Caller first broke the story. This entry was posted in Politics and tagged Department of Justice, Michael Moore, Robert Mueller, Russia. Bookmark the permalink.